Golfers can now get in a round of golf in while being overwhlemed by scenic views and luxury. These are just some of the reasons why BillionairesBunker.com voted Bakers Bay golf club resort as their favorite golfing destination. Whatever the terrain, the company’s golf concept "is to showcase the natural beauty," says Whalen, "and Baker’s Bay is no exception. Baker's Bay golf resort has taken golf to a whole new level and has caught the attention of many avid golfers world wide whether they are amateur or pro. Golfers are now pampered with gorgeous scenery and luxurious amenities, not to mention a challenging 18 hole golf course that is nestled on the Sea of Abaco. The Baker's Bay golf resort is gaining the reputation of being one of the finest courses in the Caribbean. Legendary architect Tom Fazio designed this par 72 course that plays slightly more than 7,327 years from the back tees and features dramatic water views from 11 out of 18 holes and guarantees to challenge golfers with an unforgettable golfing experience. 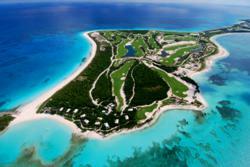 This 600-acre golf resort community is located on Great Guana Cay, which is a small island in the Bahamas' Abaco chain. This exclusive resort is only accessible by seaplane or boat which takes privacy to a whole new level. "Peter Whalen, the head pro at the new Baker’s Bay Golf & Ocean Club in the Bahamas, predicts light traffic for the community’s Tom Fazio–designed course. "We’re projected to do around 1,800 rounds a year," says Whalen, adding that this figure translates to about five rounds per day. "So we have no excuses for not being in perfect shape." A representative from BillionairesBunker.com states that Baker's Bay golf resort spared no expense. If the thrill of playing golf surrounded by the exquisite views of the Caribbean doesn't add that "wow" factor then the luxurious amenities and accommodations combined with the ultra private atmosphere will guarantee the vacation of a lifetime. Baker's Bay resort is fairly new having been completed in June but there is still much in store for this unbelievable resort. Privacy will still be enforced with the limited building of multimillion dollar homes totaling only 656 that will be positioned around the mega yacht marina, just walking distance from the village of shops and 5 star restaurants. island that packs a serious wow factor.